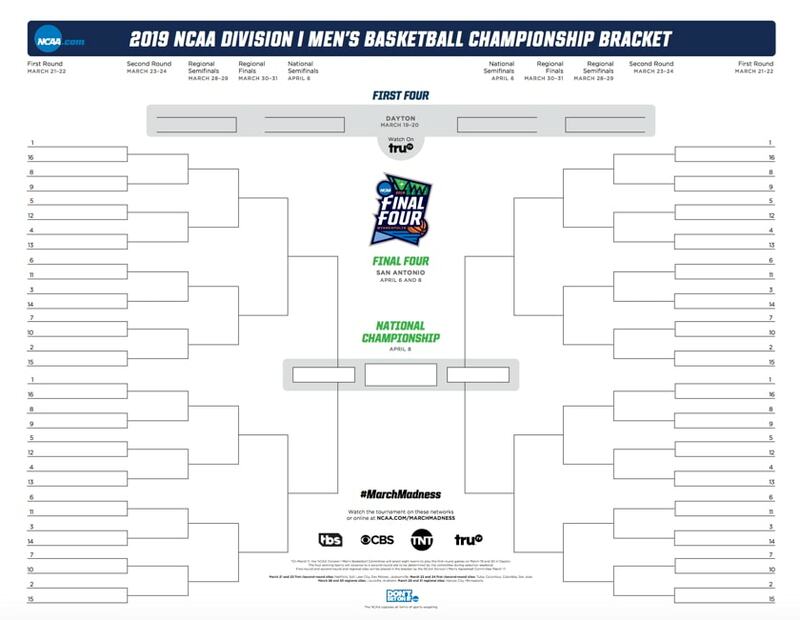 Here is the official printable NCAA March Madness tournament bracket for the 2019 NCAA Division I men’s basketball tournament. You can click or tap right here to open up a printable version of the March Madness bracket pictured below in a new tab or window. You can print the bracket in landscape or horizontal mode. It looks good either way. 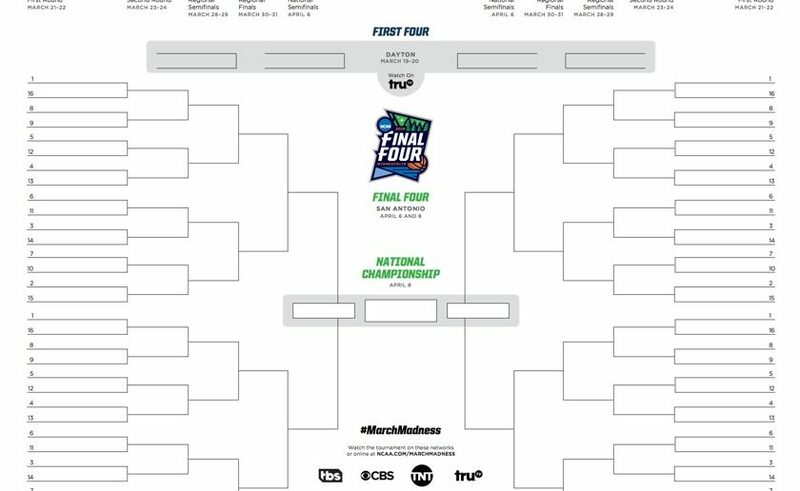 Here is a .PDF of the 2019 March Madness bracket if you’d like a copy in that format. We’ll have to be content looking at that blank bracket until the full March Madness field of 68 teams is revealed on Selection Sunday. Selection Sunday in 2019 is scheduled for March 17. The First Four begins Tuesday, March 19, in Dayton, Ohio. The first round of the tournament begins on Thursday, March 21. Regional sites in 2019 are Hartford CT, Salt Lake City UT, Des Moines IA, Jacksonville FL, Tulsa OK, Columbus OH, Columbia SC and San Jose CA. Here is information on how to get tickets to any of those sites, and the Final Four in Minneapolis. What is the March Madness selection committee? The 10-member NCAA Men’s Division I Basketball Committee is responsible for selecting, seeding and bracketing the field for the NCAA Tournament. School and conference administrators are nominated by their conference, serve five-year terms and represent a cross-section of the Division I membership. How do they decide which teams get an at-large bid? There are a multitude of stats and rankings that the Selection Committee takes into account, but there is no set formula that determines whether a team receives an at-large bid or not. What’s this new thing called the NCAA evaluation tool? The NCAA Evaluation Tool, or NET, is a tool for the committee to evaluate the strength of individual teams. It replaces the RPI and was approved after months of consultation with the Division I Men’s Basketball Committee, the National Association of Basketball Coaches, top basketball analytics experts and Google Cloud Professional Services. It includes game results, strength of schedule, game location, scoring margin (capped at 10 points per game), and net offensive and defensive efficiency. We’ve got you covered with BracketIQ. There are more than 50 guides there to help you fill out your bracket. We cover everything from March Madness history and records, to lessons from past winners of our bracket game, to 7 common bracket-picking mistakes to avoid, to how to pick your bracket based on each team’s mascot.